This Climate Data Record (CDR) of monthly mean Outgoing Longwave Radiation (OLR) flux at the top of the atmosphere in all sky conditions is on a 2.5 degree x 2.5 degree grid with global coverage from January 1979 to the present and continuing monthly. It is derived based on the multispectral High Resolution Infrared Radiation Sounder (HIRS) OLR algorithm and other methodologies. This dataset was created from HIRS OLR retrievals from TIROS-N to NOAA-19, and MetOp-A/B satellites with inter-satellite calibration adjustments and employed the empirical diurnal model for monthly mean derivation. This version 2.7 is an upgrade from the previous version 2.2-1. The main change is in the OLR regression models and the inter-satellite calibration. The version 2.7 OLR regression models improved the retrieval consistency between variant versions of HIRS instruments, HIRS-2, 2i, 3 and 4, and in turn, the accuracy of inter-satellite calibration is significantly improved, thus eliminating the spurious trends presented in the version 2.2-1 data. The data file format is netCDF-4 with CF metadata, and it is accompanied by algorithm documentation, data flow diagram and source code for the NOAA CDR Program. 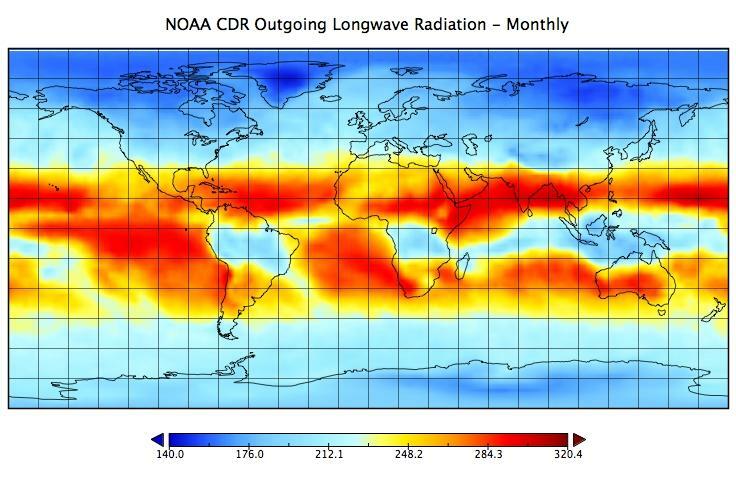 Cite dataset when used as a source: Hai-Tien Lee and NOAA CDR Program (2018): NOAA Climate Data Record (CDR) of Monthly Outgoing Longwave Radiation (OLR), Version 2.7. [indicate subset used]. NOAA National Centers for Environmental Information. https://doi.org/10.7289/V5W37TKD [access date]., Distribution liability: NOAA and NCEI make no warranty, expressed or implied, regarding these data, nor does the fact of distribution constitute such a warranty. NOAA and NCEI cannot assume liability for any damages caused by any errors or omissions in these data. If appropriate, NCEI can only certify that the data it distributes are an authentic copy of the records that were accepted for inclusion in the NCEI archives., Use liability: NOAA and NCEI cannot provide any warranty as to the accuracy, reliability, or completeness of furnished data. Users assume responsibility to determine the usability of these data. The user is responsible for the results of any application of this data for other than its intended purpose. Image of Monthly Mean OLR.